There are no good men in this book. And yet, here I am, absolutely smitten with them anyway. Vicious is one of those books that I’ve been procrastinating on FOREVER. Ever since I read (and loved) V.E. Schwab’s Shades of Magic series, I knew this one had to be next. It sounded like something I’d love and lots of trusted blogger friends already read and highly recommended it. So naturally, I procrastinated even more. But now, with the release of the sequel, Vengeful, close by, it was time. And quite predictably, I fell in love and am hitting myself for not reading this sooner. So if you’re like me… stop putting it off and just read this! You won’t regret it. Though it’s a tricky book to review without spoiling too much, I’m giving it my best shot, because I just have to tell you about this book and why I love it so much. First and foremost, the characters. Yep, the number one reason I love this book is (just like in Shades of Magic), the fact that these characters were so incredibly fleshed out that they felt completely real to me. When a group of characters becomes ingrained in your heart, that’s when you know it’s good. And that’s what happened here. Every single character was given a backstory, a life, a motive and a reason. Every single character had you feeling something fierce for them, be it good or bad. I fell in love with Victor from pretty much the first chapter. Even though he does some pretty terrible things throughout the book that had me frowning, I still couldn’t help but root for him. Hell, I’d even want him on my team. Not everyone can kill someone in cold blood one minute, and treat someone to hot chocolate the next. Eli, on the other hand, I immediately loved to hate. Even before everything goes to hell, he’s described as having a monster under his skin and it’s definitely brought out by this chain of events. But though I think he’s the most evil of the two for sure and am fully rooting for Victor here, I still can see where Eli is coming from and that, to me, is a sign of good writing and character development. And even the other characters are all just lovely, in an extremely messed up way. From 12 year old Sydney who has a terrifying power to her darn creepy older sister Serena. And from poor, cursed Mitch who always ends up at the wrong place at the wrong time to Dominic who is crippled by his pain. I became invested in all of their lives throughout this story, and to me that’s a sure sign of a new favorite. But besides the characters there are of course many other things that deserve mentioning because they are amazing. How about the way of writing where we constantly switch between the past and the present that makes the book feel like a puzzle to slowly put together? How about the moral questions that are posed on heroes and villains, powers and responsibilities, good and evil? How about the world that is so similar to our own and yet so distinctly different in a major way? How about the way this book will have you turning pages and reading way into the night because you just can’t stop reading? And how about that ending that leaves you wishing you could pick up Vengeful right now? I could go on and on, but I don’t want to risk spoiling anything to anyone who hasn’t read this one yet. Because I think it’s a story you have to discover for yourself. Just dive in and experience it. 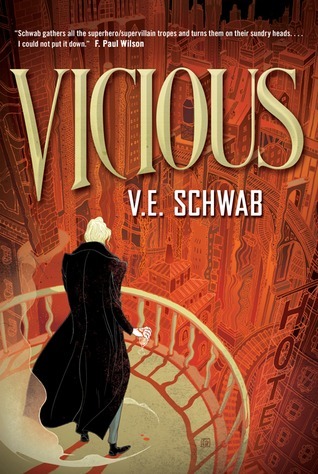 If you love morally gray characters, a thin line between heroes and villains and a group of dangerous misfits coming together, then I’m pretty certain you’ll love Vicious. HAVE YOU READ Vicious? WHAT DID YOU THINK ABOUT IT? Fantastic review Lindsey. I love when characters are in shades of grey or complicated. And the quotes … so true! Darn those dangerous misfits, lol. Great review! I’ve owned this one for awhile, and I STILL need to read it too. But I am going to! I hope to read it sometime this month with the sequel coming out. I’m so glad to hear you loved it though, and I like that the characters are done well. I really, really want to read Vicious and your review is making me want to read it even more! Though I skimmed it to avoid any kind of spoilers, just in case. It sounds really awesome. Okay, okay – it’s like you are speaking directly to me. STOP PUTTING IT OFF AND JUST READ IT! It’s sitting on my shelf for goodness sakes! Thank you so much for doing a spoiler free review, because I really wanted to know what you thought but I very rarely read reviews before I read books I’m really excited about. It sounds like I should just get over the nonsense of putting it off and dive in. Morally grey characters and a group of dangerous misfits? I’m totally there! What am I even waiting for?